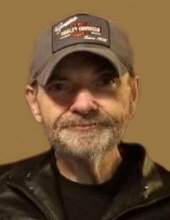 Brian P. Bentley, 55, of Waterloo, died Monday, January 28, at UnityPoint Health-Allen Hospital. He was born July 8, 1963, in Waterloo, the son of Ernest and Rosetta Murray Bentley. Brian was self-employed in his younger years and was later disabled. Survived by: his father, Ernest Bentley of Waterloo; his mother, Rosetta Murray of Waterloo; fiancé, Sandra Havens of Waterloo; two sisters, Brenda (Ron) Jungen of Raymond and Roxanne (Dean) Mobley, of Waterloo; and nieces and nephews, Shawn, James, Carl, Elizabeth, Ben, Cindy, Christina, and Nicholas. Preceded in death by: a brother, Daniel Bentley; a sister, Deborah Bentley; stepfather, Dean Burkey; stepmother, Leona Bentley; paternal grandparents, James (Mary) Bentley; and maternal grandparents, Daniel (Eva) Murray. Services: 11:00 a.m. Monday, February 4, at Nazareth Lutheran Church in Cedar Falls with burial 11:00 a.m Tuesday, at Phillips Cemetery near Bonair. Public visitation will be from 10-11:00 a.m. at the church. Hagarty-Waychoff-Grarup Funeral Service on South Street is in charge of the arrangements. Brian was a lover of music, motorcycles, and movies. He loved family reunions and eating. He always enjoyed hanging out with his nephews. He was an avid daily walker at the mall. To send flowers or a remembrance gift to the family of Brian Paul Bentley, please visit our Tribute Store. "Email Address" would like to share the life celebration of Brian Paul Bentley. Click on the "link" to go to share a favorite memory or leave a condolence message for the family.